Mega•Crafty: Double Wow! And a purple scarf update. Double Wow! And a purple scarf update. I won the art category for the Anti-Valentine contest over at dabbled. I am totally shocked. It's the first blog contest I've ever entered! 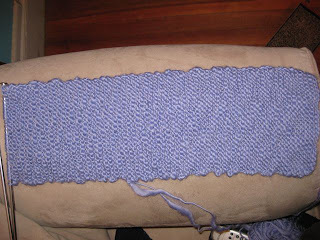 I've also been working on the purple scarf with that really neat thick and thin yarn. It's slowly getting longer. It's been living in my handbag, so I can knit a few rows here and there- at lunch, waiting in line- wherever. 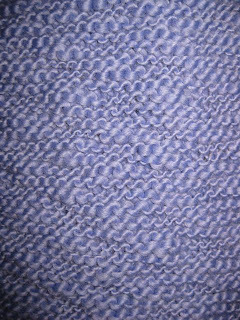 I'm not really in a hurry, this is going to be my spring scarf. I like the idea of a nice bright, fresh color in early Spring while it's still cold out- but clearly not winter anymore. So I still have at least a week before I'll really be dying to wear it. It's knitting up really cool just in plain old garter stitch because of the yarn texture. I'm going to have to decide soon, it's just about long enough to be a neck warmer.